Video advertising on over-the-top video services has lots of room to grow, and data-driven solutions utilizing third-party data will need to be a key part of that, according to a new study commissioned by the video ad serving platform SpotX. The study, called “TV is Total Video: Predicting OTT and the Future of Video Advertising,” which was conducted by the media research group Kagan (owned by S&P Global Market Intelligence), found that 85% of executives surveyed from OTT providers, pay-TV providers, content owners and advertisers said that third-party data will be an important driver of the OTT ad market. The survey also shows that advertising strategies are shifting as a result of consumers embracing OTT video. 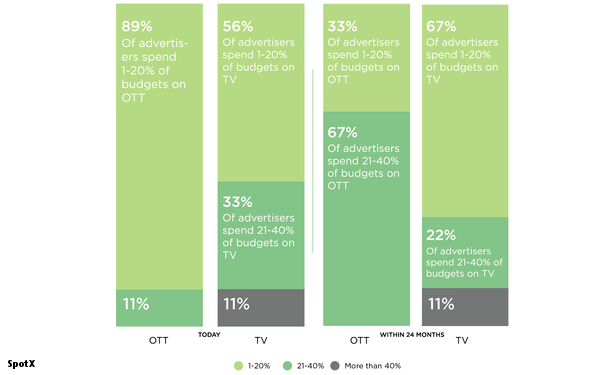 89% of advertisers surveyed currently spend between one and 20% of their ad budgets on OTT, while 11% of advertisers surveyed spend between 21-40% of their budgets on OTT. However, the survey predicts that within 24 months, only 56% of advertisers will spend 20% of less of their ad budget on OTT, with 33% spending 21-40% of their budgets there, a significant increase. Of course, like any new market, OTT video has some growing pains, and that is reflected in the report. While the potential for interactive, targeted advertising is enormous, there remains a lot that has to be done to get there, starting with consistent measurement across platforms. The advertisers surveyed were unanimous that third party data "was a strong driver for the adoption of audience-based buying and selling of ads," according to the survey, with 94% of content owners in agreement. The OTT marketplace is mature, in that consumers are wholeheartedly embracing new services and platforms, and advertisers and content owners appreciate the opportunity it offers. However, as the SpotX survey shows, many of the changes to come to the ad business are still nascent, but poised to accelerate over the next few years. 1 comment about "Third-Party Data Key To Growing OTT". Eric Nelson from Dicom Inc., February 7, 2018 at 10:37 a.m. The challenge still reamins that OTT is still not effective for local advertisers. There is great promise and hope, and effective on a national level with mega-scale, however when you try to run a campaign on a spot market/DMA level with any targeting, the ROI and scale doesnt exisit. I do think that will change, but not until broadcast and cable systems operate in a true programmatic environment.